The designing of the earrings was a family affair: YY’s father had made a beautiful, heirloom pearl necklace for the bride as a wedding gift. 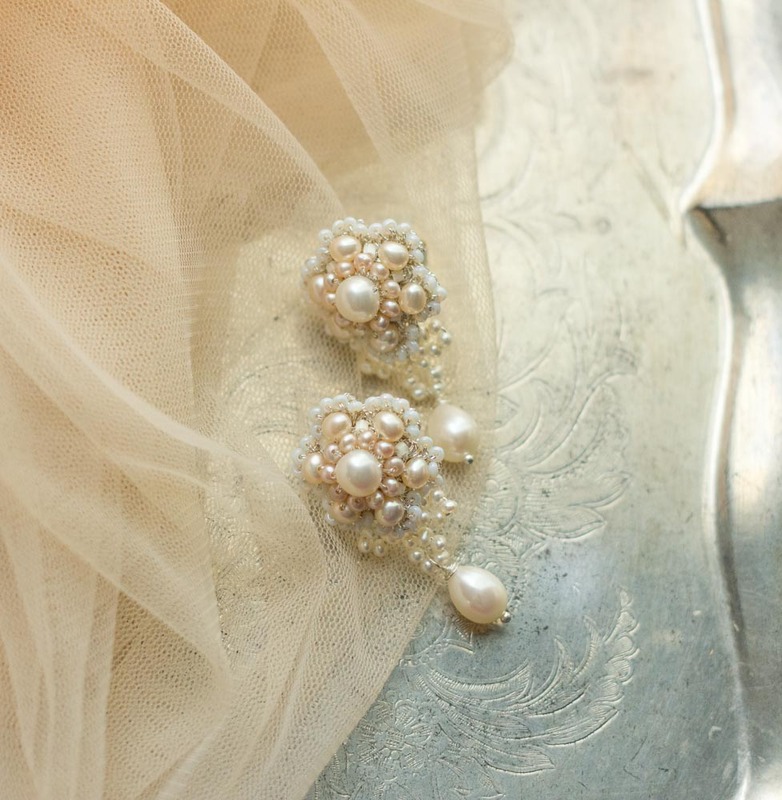 This special piece inspired the color scheme for YY’s earrings: the necklace incorporated three different colors of pearls in shades of light and dark peach and ivory. YY’s sister, Yue Xiu, also helped with the custom order, fielding the many emails sent back and forth throughout the design phase. YY opted for the “Orange Blossom” style from my Language of Flowers Collection as the basis for her custom earrings. I selected a range of peach and ivory freshwater pearls—carefully chosen to match her necklace—to use on her custom order. The finished earrings featured stylized lace flowers created and embroidered entirely by hand, as well as small pearl drops and beaded leaves made with the tiniest of seed pearls. YY looked absolutely radiant on her wedding day, wearing a gorgeous gown covered in appliquéd lace flowers. The gown had an illusion tulle neckline asymmetrically embellished with the flowers, and pearl buttons and beadwork adorning the back. The fitted gown flared into an ethereal train, with more lace flowers peeking out amongst the folds of tulle. YY completed her look with a classic updo, and beautiful red, white, and gold chura, traditional bangle bracelets worn by the bride in Indian wedding ceremonies. A big congratulations to YY and her husband Sunny! Scroll down to see more images from their wedding, taken by Rafie’s Photography.